SPORT - OK II 9 - #CU 12S - On Sale! WHAM 15 - #358 - On Sale! Exotic design gives the appearance of something from the 21st century. It is available for construction in either plywood or aluminum and for either outboard or inboard power. Either construction method might be suitable for the amateur builder; however, it is recommended that only those versatile in welding and working aluminum should attempt that project. The skin is laid over timber or aluminum frames for which the plans supply full size patterns. A basic knowledge of welding is needed if building in alloy. The hull is of moderate Vee design with a dead rise of 17 degrees at the transom. This constant dead rise gives excellent directional stability and, as the figures below will show, the likely performance for either inboard or outboard power could be well above average. The hull design should provide soft riding at speed to withstand the pounding it will get at top speed while the entry should make her comfortable when speeding into a chop. There should be sufficient overhang and flare at the stem to deflect the spray down and keep the occupants dry in average conditions. The stem itself is extremely sturdy. The outboard version shows the helmsman's seat forward to starboard with another seat to port. There is walking space between. Aft in the cockpit a bench seat runs the full width and will seat three in comfort. The outboard is mounted in a large self draining well with room for tanks well protected underneath. There is a lot of room under the foredeck for the lunch basket and spare clothes. Either push pull or cable steering can be used to the motor. In the inboard version, the bench seat moves right aft and the engine is housed in an engine box amidships. This can be soundproofed if desired. Very substantial engine mounts run the full length of the hull so that the bottom becomes almost indestructable. The propeller shaft is supported by a bracket attached to hull and mounts and a bronze rudder is mounted outboard under the angled transom with cavitation plate above which doubles as a boarding platform for swimmers. The plans are well presented with information for the amateur well taken into consideration. Full size patterns for all framing, stem and transom are included. 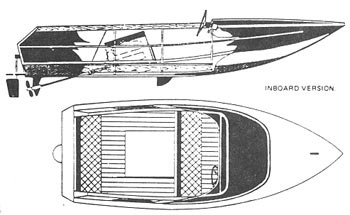 There are two versions, inboard and outboard. If you plan on using a jet-drive or an I/O, order the outboard version. When you order the plans, send an email advising which version you need. See our Boatbuilding Supplies section on this site for details on the Racing Steering Kit and Racing Throttle Kit. Plans & Patterns Only $32, Was $65.